Police raided the headquarters of Airbus parent EADS and a major shareholder as an investigation into suspect share dealings intensified Tuesday, overshadowing a ceremony to mark the much-delayed A380's approval for commercial service. Hours before the Toulouse gathering, at which European and U.S. aviation officials formally certified the 555-seater superjumbo for passenger flights, investigators presented search warrants at the Paris offices of European Aeronautic Defence and Space Co. and Lagardere SCA. Judicial officials who asked not to be named, citing French rules on the confidentiality of investigations, said the raids were led by investigating magistrates Philippe Courroye and Xaviere Simeoni as part of their criminal probe into suspected insider dealing linked to the A380 production delays. Prosecutors opened the investigation Nov. 20, five months after it emerged that ousted EADS co-chief executive Noel Forgeard and several of his former colleagues had sold off company stock ahead of an internal inquiry into the A380 problems. Lagardere and Germany's DaimlerChrysler AG also announced they were reducing their EADS stakes at around the same time. Forgeard has denied any wrongdoing. EADS shares lost more than a quarter of their value in one day after the production problems were announced June 13. Later the same month, France's Financial Markets Authority opened an insider dealing probe and carried out searches at EADS and Airbus offices. Louis Gallois, who replaced Forgeard at EADS in July and has since also assumed the role of Airbus CEO, said the police raids were a "predictable" part of the investigation and their timing was down to chance. "It's not for me to comment on the actions of law enforcers," Gallois said after the ceremony in Toulouse. "My attitude is one of total openness." Gallois replaced Airbus chief executive Christian Streiff after Streiff resigned in October. Streiff wanted to report to the parent company every quarter and have final say on Airbus appointments, while senior EADS executives demanded closer oversight, according to officials. The A380's certification had promised some much-needed good news for Airbus, set to fall behind U.S. rival Boeing Co. on orders this year for the first time since 2001. With Tuesday's certification, signed by officials from the European Aviation Safety Agency and U.S. Federal Aviation Administration, the world's largest passenger plane cleared its last official hurdle before its first delivery to an airline next October. The ceremony completed a test-flight program in which five A380 planes have logged 2,600 flight hours since the closely watched first flight in April last year. In the program's last phase, one of the planes recently completed 70,000 nautical miles of "route proving" flights across the Asia-Pacific region, simulating intensive airline operations in extreme conditions — including takeoffs and landings using high-altitude and snowbound runways. The accumulated delays to the A380, totaling two years, have wiped about $6.3 billion off forecast EADS profits — a figure that includes estimates for the compensation paid to angry customers. FedEx Corp., the world's largest express transportation company, last month canceled its order for 10 A380s, and Airbus said Dec. 4 that further cancellations were still possible. Airbus' market share by value has fallen further in 2006 — after slipping to 45 percent last year from 54 percent in 2004 — as Boeing's 777 and planned 787 midsized planes steadily eclipsed the older, less fuel-efficient Airbus A330 and A340. 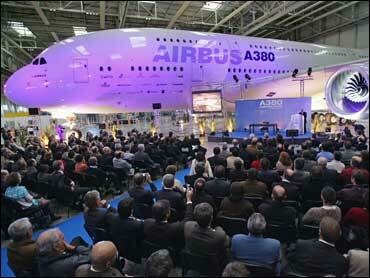 Airbus has received 166 orders and commitments from 15 customers for the A380, according to a company press release. Singapore Airlines is slated to receive the first delivery in October 2007. EADS shares rose 0.8 percent to close at $32.07 in Paris.